Kairos Christian School (run by Asociacion Kairos Guatemala) is a private Christian School in Ciudad Vieja, Guatemala. 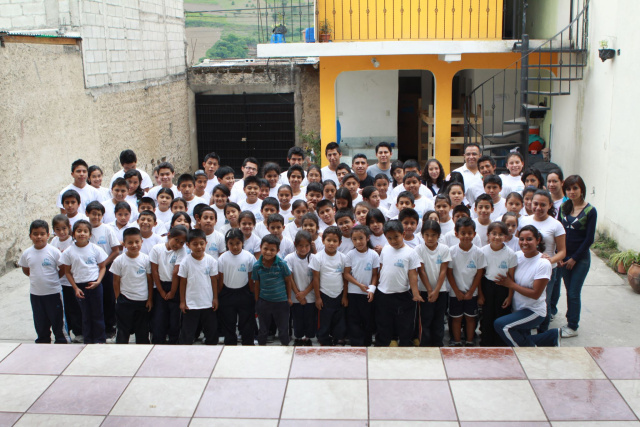 Kairos North America was created as a ministy of First Christian Church to help support the school in their efforts. The Kairos school began as a Saturday feeding program for a group of neighborhood kids and has evolved into a school that serves over 80 children from Preschool through Middle School. 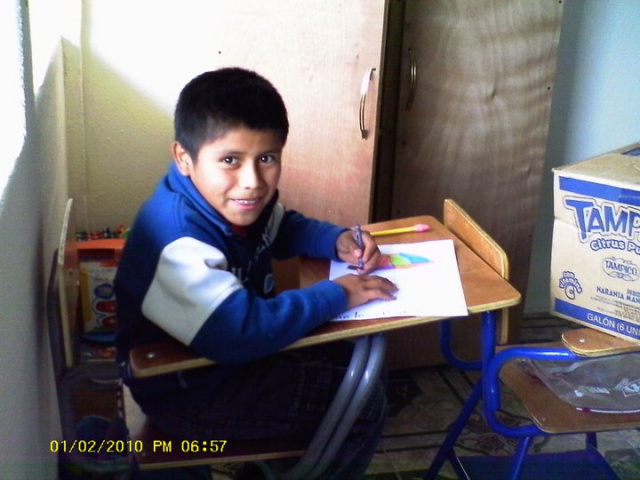 Find out more about the school and follow their story at www.asociacionkairosguatemala.org or find them on Facebook as Asociacion Kairos Guatemala. Make a tax deductible donation to help support Kairos through Kairos North America, a 501(c)3 ministry of First Christian Church. Blessings they just keep coming…or have blessings always been in my life and I just didn’t recognize them. I think the farther I travel in my faith journey the more I receive. One of the blessings that was given to me later in my faith journey, I feel obligated to tell you about. First of all I am not a writer. I have been told I write the way I talk, and well English was not one of my better subjects. There is one blessing that keeps coming back to me. 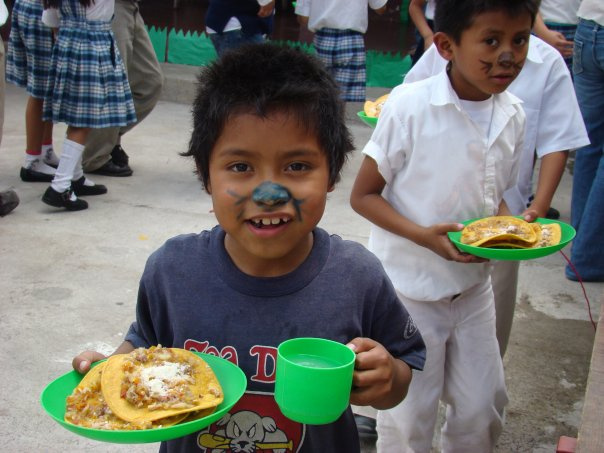 In 2009, Bonnie, my wife, and I were in Ciudad Vieja, Guatemala, helping with a feeding program (I’ll explain the why, what and where later. That is another blessing in my life.). It was during that meal that I knew God was calling me to help. God has not let me forget that day. The meal--two large pots, one filled with rice the other with hot dogs in a tomato sauce, and of course the corn tortillas. It was the best meal ever! The kids that were there that day were neighborhood kids, maybe 20 or so, and I also cannot forget all the stray dogs. Some of the children were sitting at a wooden table, others sitting on logs, and some on buckets. When the children saw us they all wanted to give us their seats. After giving thanks, Antony (who, I will explain later) was walking among the kids and singing with the kids songs of praise, praying and giving thanks. The children were just so happy, smiling, laughing--not a care in the world. The blessing I received that day was the tears in my eyes and the feeling you get when you can’t talk. I don’t try to hold back those feeling anymore, it just feels good. I knew after that day that somehow, some way, I was not going to be able to return to the U.S. and forget those kids. And of course those dogs! I did come back and take Spanish classes for three years (the same Spanish 101 class three times) Hola. Ok, so how did my wife and I get so involved? I guess we can thank a couple we met at church, Greg and Felicia Huff. The Huffs adopted us as their kids grandparents. It has truly been a blessing (most of the time). The Huffs have also adopted three kids (for now! ): Keegan, a son from Guatemala; Otoniel “OT”, a son from Guatemala; and Keeley, a daughter from China. Next ???? We were asked to travel with the Huffs to Guatemala to pick up OT in January of 2009. The Huffs have been a true blessing to us sharing their kids. 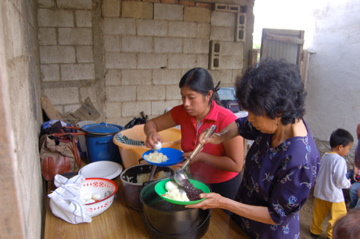 The feeding program was started in 2004 by the Garcia Family. Mayra and her family believe that the best way to help is not just “hand-outs” but by offering a way for them to improve their standard of living. They saw a need for a school. Their vision was that in order to become a Christian leader, there needed to be an institution through which Christians leaders can be raised, willing to serve God and then community so that with their deeds Guatemala can have a positive change. They decided to name the school “Kairos,” which means God’s timing. Kairos has blossomed since its beginnings. What started out as a feeding program has grown into a school with 92 students that can provide a stable place for learning in a Christian format. The school building now has ten classrooms, a computer room, music room/library, kitchen, bathrooms, showers and office space. In my 70 some years of life, my faith has grown stronger (I must be honest and say not a steady growth). I wish my faith were as strong as Mayra’s. Mayra just keeps saying “Pray Jim” so I will. Mayra has a vision of a larger school, maybe a pre-school. It will happen. I will pray for it and want to be a part of it. One other blessing my wife and I have is a very loving church family. The church has been supportive in our efforts. It would be impossible to support this mission without them. Kairos is now my passion and mission. I believe I have been called to keep working in the effort.